Did you know that collision with vessels is one of the leading causes of death among whales, such as the endangered North Atlantic right whale? Collisions can also cause thousands of dollars in damage to boats and injure crew. 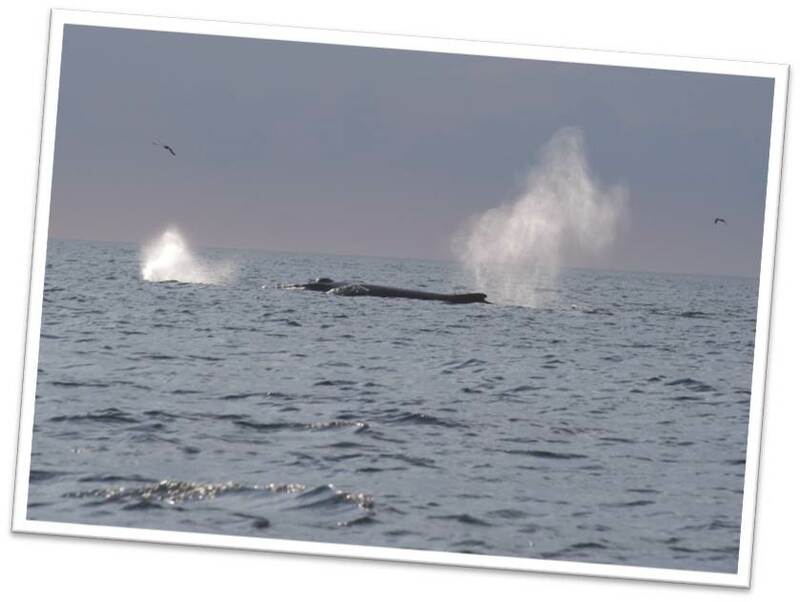 US Sailing, the Audubon Society of Rhode Island, New Bedford Whaling Museum and Whale and Dolphin Conversation have joined forces to make the oceans safer for both sailors and whales. Go to www.seeaspout.org/sail to learn the simple things you can do to protect whales and your vessel. You can also help whales by reporting injured or entangled whales to 1-866-755-NOAA or download the free app to track right whale sightings: Whale Alert, available on iPhone and Google Play. Follow these straightforward tips to safely and responsibly watch whales. Remember: All whales are protected by federal law. These tips will help you from accidentally illegally disturbing these animals. If you see a spout, tail, or a breaching whale, please slow down and post a lookout. Some whales may dive for 20 minutes or more while searching for food. 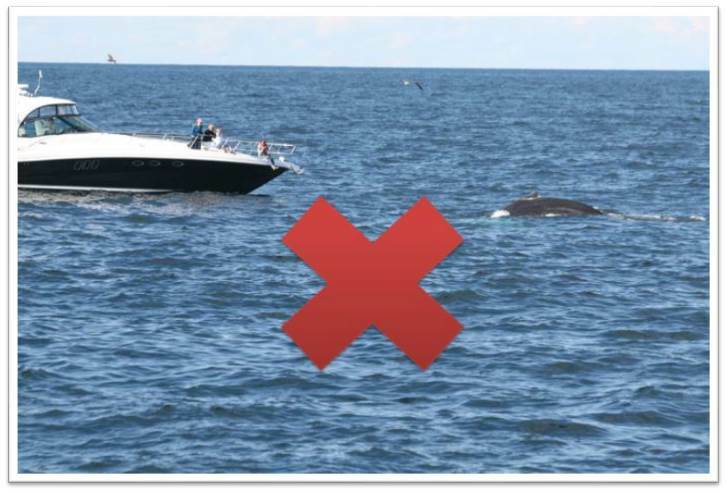 If you’ve seen one whale, many more could be close-maybe too close to your boat and its spinning propellers. Proceed cautiously! Always parallel the whale’s course and don’t approach head-on or cut off the whale’s path. Follow official approach guidelines and adhere to all approach regulations. Lots of Boats, Then Talk to Folks! 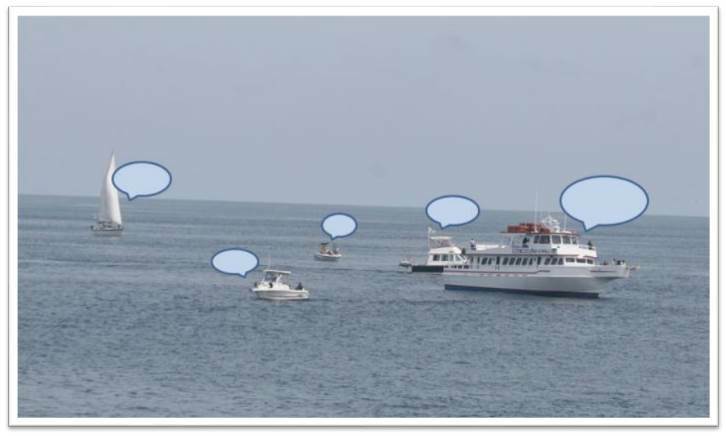 If there are other boats watching or traveling near whales, hail them on your VHF radio (channel 9, 13 or 16 for hailing) and coordinate your viewing efforts. Avoid Trouble, Steer Clear of Bubbles! Humpback whales sometimes feed by creating bubble clouds. They blow bubbles below the surface of the water to confuse and condense schools of small fish. 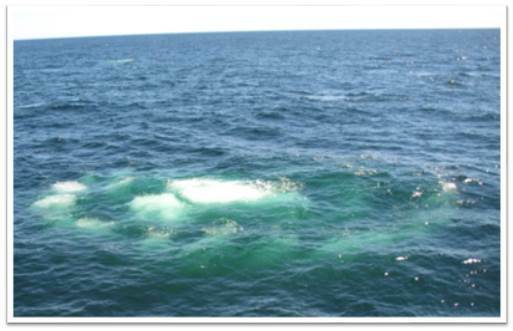 Bubble clouds look like light green, foamy patches on the surface of the water. Never approach, or drive through, a bubble cloud as a hungry whale is likely just below the surface. Don’t Chase, Give The Whales Space! Closely approaching a whale may cause the animal to move away from its food source. Respect the whale’s behavior and keep your distance. If a whale moves away, don’t chase it. 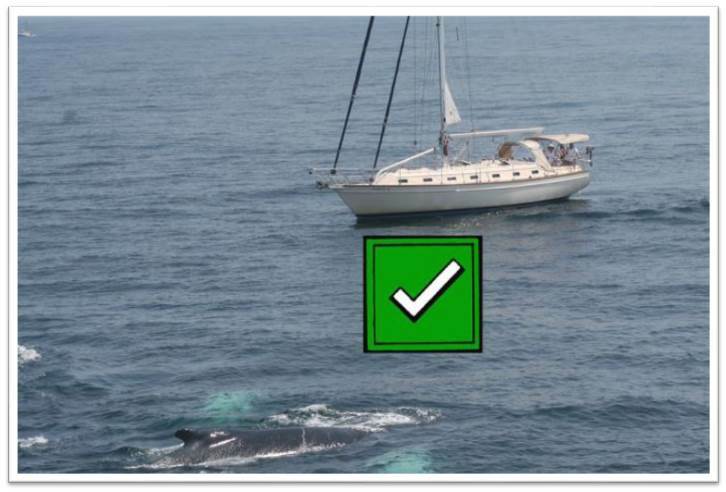 A cautious boater may get to see whales feeding, playing or breaching. Enjoy the whales; don’t endanger them! 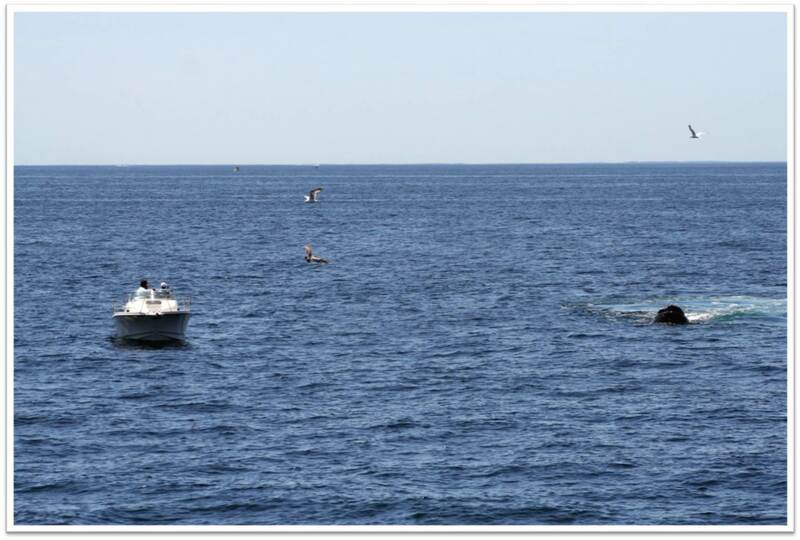 In US waters it is illegal to approach a right whale within 1500 feet, or 500 yards (3 football field lengths). Other countries may have different restrictions. Drop Your Sails When Watching Whales! 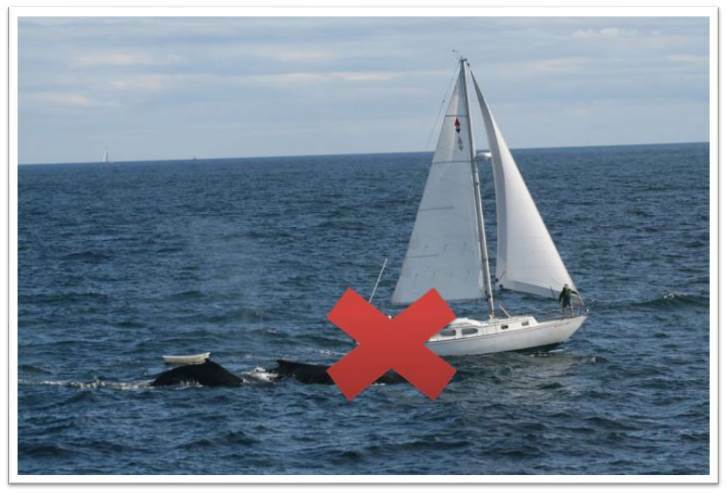 A boat under sail may not be able to reduce speed or stop at a safe distance from a surfacing whale. When in the vicinity of whales, it is best to utilize your auxiliary motor and proceed cautiously.